Sasha's Baby Trend Expedition Double Fixed Wheel Jogger Discount Package (DP8) offers customers a substantial savings. The normal price for all 3 of the products (with shipping) shown and mentioned below would normally be $149.00. By taking advantage of this package, we offer all 3 products now to our customers at a discounted price of $127.85.. This represents a savings of $21.15, and Includes all Shipping Costs. The special offers for these discount packages only apply to customers living in the U.S. ( If you live outside the U.S., call or email us for shipping rates ). This package includes: One Model 902A Baby Trend Double Fixed Wheel Jogging Stroller Sun, Wind & Insect Cover, One Model BT-EXP2 Baby Trend Double Fixed Wheel Jogging Stroller Rain & Weather Cover, and One Model TB1 Baby Trend Double Fixed Wheel Jogging Stroller Tote Bag (Navy Blue). To find out more information about each individual product included in this package, CLICK on the PINK TITLE BARS ( at the top of each box). Pages will open giving full details of each product ( for some products, you may have to scroll down the pages a little). Sasha's Sun, Wind and Insect Covers protect a baby's/child's delicate eyes, skin and body from the sun’s cancer causing UVA/UVB rays, heat, glare, wind, dust and debris and harmful insects, keeping baby cool, safe and comfortable. They also prevents fading of the car seat, Stroller and Jogger material. They are flame retardant and water resistant. And it attaches easily. Uses: anywhere outdoors. 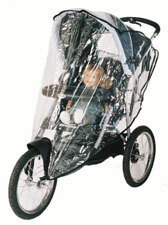 Sasha's clear vinyl Rain and Weather Covers protect a baby/child's delicate eyes, skin and body from the Rain, Wind, Sleet and Snow, the Cold, Dust and Debris, and Flying Insects. They are waterproof, have holes for ventilation, and are easy to attach. They allow parents to see in and children to see out at all times. Sasha's Tote Bags provide parents with a place to store things while outdoors. There are many compartments to store all kinds of useful and necessary things. Sasha's Storage/Travel bags makes things easy. Whether you're performing daily errands, or just storing items in the garage, you can protect your Infant Carrier / Car Seat from harmful elements ( i.e. dust, dirt, grease, tar, etc). Or while traveling, you can protect your Infant Carrier / Car Seat from the rough handling and damage of luggage at airports, boats, buses, taxis, and trucks with our handsome and versatile Travel/Storage Bags. This Travel bag makes it easy for you to take your infant carrier/convertible car seat on a trip! Ruggedly designed & built to last. Sasha's offers a complete line of Infant Carrier / Car Seat, Stroller and Jogging Stroller products. Please browse through our website pages.